While not resurrecting the ‘Violent Crime’ them I just ended yesterday, I’m sad to see that I did so just in time. Without detailing them, I saw there were at least FIVE reports of varying levels of violent crime reported tonight, in places I might possibly have been in. There really is something wrong, and it almost seems to be being ignored. Where’s MP Paul Sweeney when there’s something SERIOUS to be raised? I used to enjoy looking after a forum that covered some of the Clyde coast resorts, mainly because I used to haunt them, and it meant watching the related news feeds for articles relating to events which took place there. That ended when the owner died, but I kept watching the feeds for a while, but gave up on them as the events became fewer and local media concentrated on stories relating to violence, drugs, and crime. It was sad to see the change, but I suppose those stories attract more ad clicks. Earlier this year I noticed I appeared to be reading more violent crime articles on the street I spend many hours walking, and started to note them in the blog, provided I could classify them as things I had ‘Just missed’ (or had just missed me). Sadly, either things have recently become much worse, or the media is reporting more of them, as not only did this trend continue, the level of violence increased from simple brawls, through robbery with violence, targetted attacks, and murders, all taking place far too close to spots where I might be found. The only positive note is that many take place at times I wouldn’t be nearby. Having proved my point (unfortunately), I wonder if there will be a media/police article later this year, about an increase (which there surely must be if it carries on at the present rate)? Stories this week mark the end of this recurring theme, with news from only a few streets away of a man being found violently murdered in his home some days after the event (after relatives asked police to look for him after he disappeared some days earlier). Update: Police later confirmed that the death is not being treated as suspicious but enquires continue. I hope the media remembers to report the finding of that last one – how does a 20-year-old end up on waste ground, badly burned, and die, and that is not ‘suspicious’? Glasgow may be making a big noise for itself as a tourist and film-making venue, but I have to say that after spending a few weeks watching the violent crime reports – and the ones I mentioned were ONLY found on places walk to, there were many more NOT mentioned as they didn’t meet the criteria – there is something wrong here. However, as I’ve now managed to make myself feel like locking myself indoors and not going out after reading about what’s happening on my doorstep, this theme has done its job and won’t be carrying on. At least I seldom hit Govan nowadays, and certainly not at that time. One of the attackers also wore goggles during the assault in the flat in Drive Road, Govan, at about 23:30 on Wednesday. This is both a time and place I’d be likely to be, IF I was out and about (which the weather means I’m not). A Police Scotland spokeswoman said: “Police are investigating an assault on a woman which occurred in a lane in the Trongate area of Glasgow at 5pm on Wednesday 6th February. Maybe not the sort of incident I’ve been listing recently, as there is a definite increase in violent crime, but mugging schoolchildren in broad daylight in the afternoon is definitely worth including. Especially after I just posted this about the same spot. I used to be here quite often, but not these days, and it could be around the same time this mugging took place, so that’s another reason for including it. A Glasgow secondary has issued a safety warning after two of its pupils were mugged while walking home from school. Staff at St Mungo’s Academy in Gallowgate are to discuss security measures with parents after the youths were attacked and robbed after class on January 16. They had been making their way home when they were targeted sometime before 4.40pm in Slatefield Road. Police are currently investigating the incident. It’s depressing to see this increase continue. Leave their cars idling in the street? Police are warning motorists to take care when defrosting cars on cold winter mornings. Officers say they have received numerous reports of attempted thefts of vehicles which have been left running to defrost. They are reminding drivers to be vigilant and are urging them never to leave cars unattended. A Police Scotland statement reads: “Opportunist thieves operate in residential areas on frosty mornings looking for cars left unattended with the engine running. It takes a matter of seconds for someone to jump in and drive off. I find it hard to believe, but as I walk most place now, can confirm the shocking number of cars I pass which are left idling in the street, with no driver nearby, or even in sight sometimes. I’m pretty sure not many of them (more likely none) are fitted with systems that allow the key to be removed to allow ‘warm up’, and will kill the engine if any of the controls are operated before the key is inserted. That said, I do remember reading of one Mercedes owner who WAS fined for this some years ago even though his car was secured by an automatic system so it could not be entered or driven. A passing police officer noticed the exhaust, and would not accept that the car was secure/undrivable, and issued a £30 fixed penalty notice when the owner/driver refused to accept that his car was not secure and had been left that way in the street with the engine running. I wonder what he would have done with one of my cars, fitted with a fuel powered heater that would start on a timer, and have the car nice and toasty warm for you. It had an exhaust! But the car engine wasn’t needed. It’s got to be on a stupidity par with the folk I see pull up at the kerb and jump out of their car and run into shops, leaving the engine running. On the other hand, I’ve yet to see any of them lose their car as some passing opportunist jumps in as soon as they get into the shop, and drives their car away. I’ve always thought about trying it, but I’d prefer not to face the consequences. Anyway, this pic made me laugh, supposedly and example. Clearly NOT a frosty morning, look at the rest of the cars in the pic! I do like the ‘Ice Bandits’ reference. What surprises me is the fact that this story has advice from the police, but fails to mention that it is an offence to leave a vehicle with the engine running while unattended. Doing this can incur a fixed-penalty fine under the Road Traffic (Vehicle Emissions) Regulations 2002. Doubled if unpaid within a given time frame. I also note that a driver who left a car parked on the road unattended, running, with the keys in the ignition was committing an offence of ‘quitting’. The offence is against S42 of the RTA 1988. This section deals with Construction & Use offences. Quitting is dealt with by Regulation 107(1) of The Road Vehicles (Constriction and Use) Regulation 1986 (SI 1986/1078 ). And let’s not forget Glasgow’s by-law on idling, which will get you a fine even if you are in the vehicle and doing so unnecessarily. I’ve noted that the council’s own web site has (or had) a section that gave the number of such fines issued, so it does happen. It took them TEN DAYS, but at least one of our local media sources eventually picked up on this warning. Having to de-ice your car during the cold winter months is a massive bugbear for many motorists. It’s usually the same routine, you wake up in the morning and realise your windscreen is thick with ice. So you pop the engine on, turn up the heating full blast and head back into the house while your vehicle defrosts. It’s a common thing to do, but not many people know that it’s actually illegal. Leaving your car unattended is against the law as drivers are expected to always be in control of their car while the engine is running, even when defrosting, reports Plymouth Live. A police spokesman explained: “Anyone who needs to defrost their vehicle must ensure they stay with it and don’t leave it unattended with the keys inside. “Leaving the engine running to ‘warm up’ during the winter months not only risks having the vehicle stolen, it’s against the law. “Don’t make it easy for opportunist thieves because they don’t even have to go to the trouble of breaking into your vehicle if you have left it running for them. Police have reported a rise in ‘frosting’ in recent years, which means having your car stolen when you leave the keys in the ignition to heat it up. I’m tempted to suggest that people would be more inclined to pay attention to the fact that far from “may not pay out”, their insurers will not pay out if they are daft enough to leave their cars unattended with the keys in (as against this being illegal). But, nowadays they’re probably not likely to bother, as they’ll probably be happy to go whining to the media, or onto social media, and complain about their ‘useless insurers making up a reason not to pay out’ on their claim. Not really much to add, but some people are disgusting, especially at this time of year. A would-be thief threatened a woman with a syringe before trying to grab her bag as she left a pharmacy in Shettleston in Glasgow. The robbery bid happened on Shettleston Road, opposite Etive Street, at about 09:10 on Saturday. The man let go of the woman’s bag after a struggle and made off along Shettleston Road towards the city centre. The woman, although shaken by the incident, was not injured. The suspect is described as white, 5ft 4in tall, 25 to 30 years of age, with dark hair, of skinny build and with a gaunt, pale complexion. He was wearing a dark, shiny jacket and black tracksuit bottoms. These types don’t even care about the police. Going from my own memory, this is the second violent incident to have taken place almost outside Shettleston Police Station in recent years. Pity it was 9 am and not 9 pm. This is the part of Shettleston Road where the Christmas lights are fitted. The Chemist’s Shop is on the left, near the illuminated sign, while the Police Station is on the right, where the illuminated square clock can be seen mounted on the side of the building. Last week I was thinking it was just as well I wasn’t wandering around as usual, as I might have been in Baillieston. 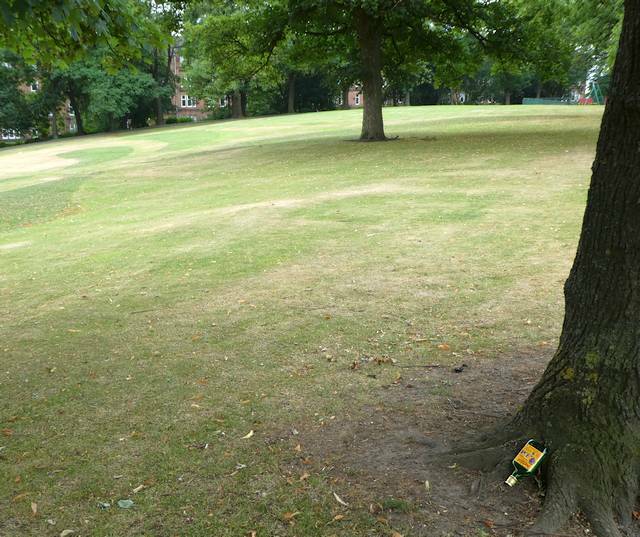 Lots of Buckfast to be found there. After the recent eBay howler in Glasgow, I thought the same was true for this story. I’m always amused by the way criminals just don’t get what they’re doing wrong, especially the ones like ‘Brenda’, who is apparently ‘Angry’ about being caught and fined. The 63-year-old said she was angry that she had been prosecuted and she now wants to warn others not to get involved in offering teeth whitening products and services. Part of my business once involved dealing with tests on people, and I can tell you that one of the first things we did, before even starting to set it up, was contact all the relevant authorities, and our lawyers, just to find out what sort of trouble we might get into as a result. But I guess we had a head start on this, since a lot of our work was fiscal (could be used as evidence in court), even if that seldom happened. “Brenda’s” response/atitude reminded of one of the few instances where I was present as a habitual shoplifter was themselves ‘lifted’. As this individual was carted off, their haul was also taken as evidence. It’s funny how some spots of the River Clyde’s banks seem to collect rubbish, while others seem to stay clean, and the odds of finding something interesting (carried along and dumped by the river seem to be low. I’ve mentioned this before, and think the reason is down to the route the river takes, and it doesn’t pass close to populated places near people (who can drop goodies) until it reaches Glasgow. However, in this case, although the stuff was on the riverbank, it wasn’t the river that dumped it there. 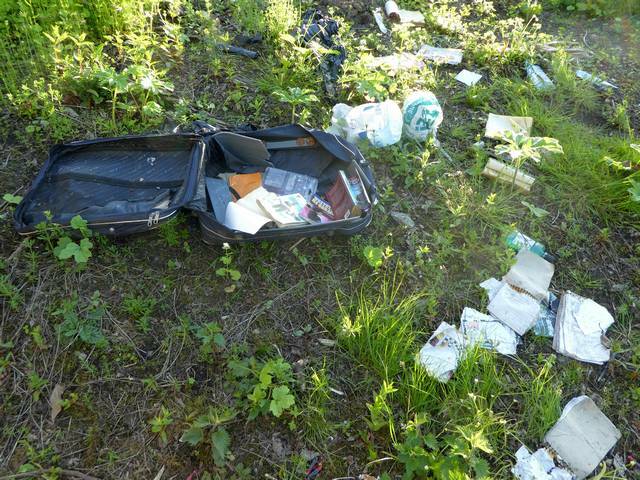 Looks like some Polish traveller had their luggage stolen, and it was taken down to river, where it could be raided on a steep bank out of sight of the road. Nothing of value was left, only a selection of Polish literature, notes, and cheap stuff like odd pens. There was ONE interesting detail though – the packaging for a soft (toy) hand gun. While not illegal, increasingly restrictive firearms’ legislation in Scotland, and the chances of a “Shoot first and ask questions later” response by armed police, who can’t be sure if a good replica is a genuine firearm or not, or the state of mind of the person issuing threats with it, are sufficiently high to render it a ‘Bad Idea’. The damp had got to the printing, and while I could see the details identifying the usual ammo and its weight (plus the obvious muzzle velocity claim), it wasn’t clear if this was CO2 or spring powered.